At the end of last term I introduced the kids to Picasso following a long weekend trip to Sydney to visit the NSW art gallery and the Picasso exhibition. (I was disappointed to find that while I was in Europe last year the Picasso Museum in Paris was closed for renovation- only to find that some of the collection had travelled to Australia while I was in France! So I just had to go and see it in Sydney.) I bought several books for kids while I was at the art gallery several of them focused on Picasso. They were fantastic picture books suitable for introducing this significant modern artist to the children from year one to seven. 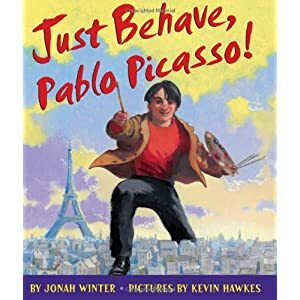 For the older children I used a book called 'Just Behave Pablo Picasso'by Jonah Winter and another called Picasso and Minou. 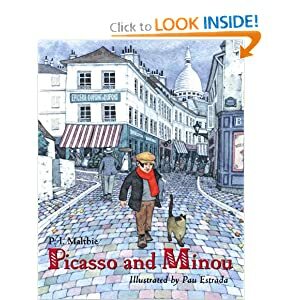 Both books introduce children to the life of Pablo Picasso and his personality in a readily accessible way in a fun enjoyable story picture book fashion. With the children in rooms 19 and 20 (yr 4/5) I looked at some really simple line drawings of strange faces that Picasso had drawn. 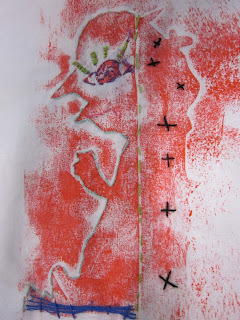 I used a book of step by step draw like Picasso for the kids to follow then they had a go at creating some of their own. From those we used the patterns and lines to create potato prints to decorate the surface of a piece of fabric. 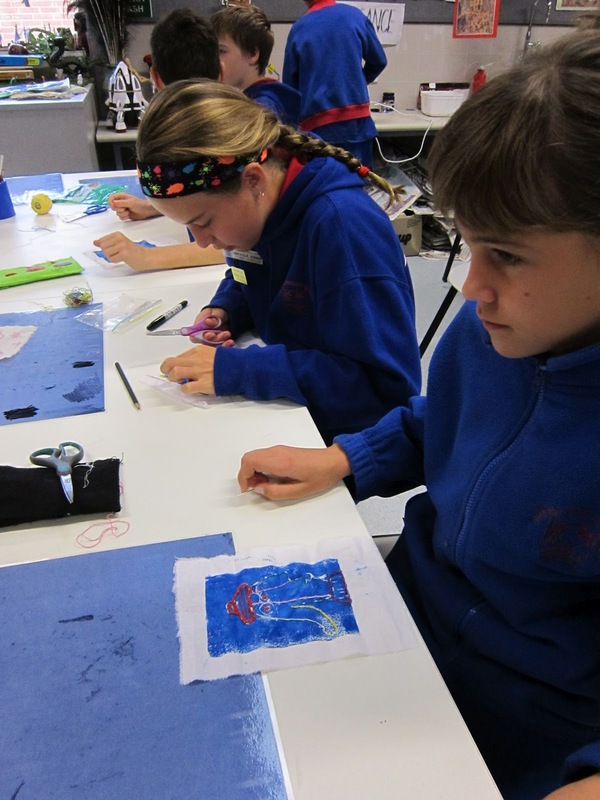 The children in Rooms 2 and 3 (years 5-7) created collograph prints based on Picasso's cubist portraits these were then printed on paper and then fabric. 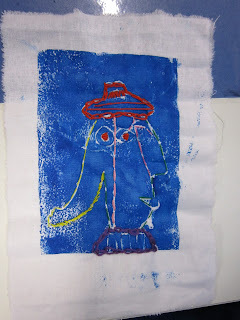 These prints have been the basis of a textile project for these classes. I made up sewing boxes for each group. 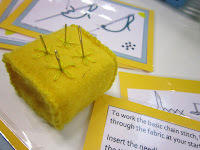 Each box had a little pin cushion with a needle for each child each needle had to be returned at the end of each lesson before they could leave the studio - I don't think we lost a single needle!! 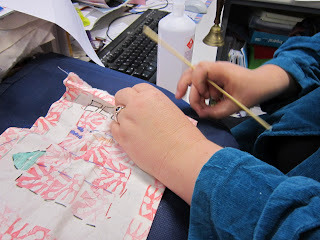 There were also sets of sewing cards that I had made up showing a variety of embroidery stitches. The children had time to practice and experiment with these stitches on scrap fabric before venturing on to the embellishment of their printed fabric. Most of the children had sewn before in previous years when they made their pencil cases. So apart from a bit of a refresher on knot tying and needle threading techniques the kids were off. I rarely thread needles for kids or tie knots rather I demonstrate each step by step and tend to show a couple of ways for the kids to choose from. Having said that I do make sure that I buy needles with eyes that are of sufficient dimensions to make threading possible at each year level while still ensuring that they will go through the fabric easily so the sewing process is not too tedious. 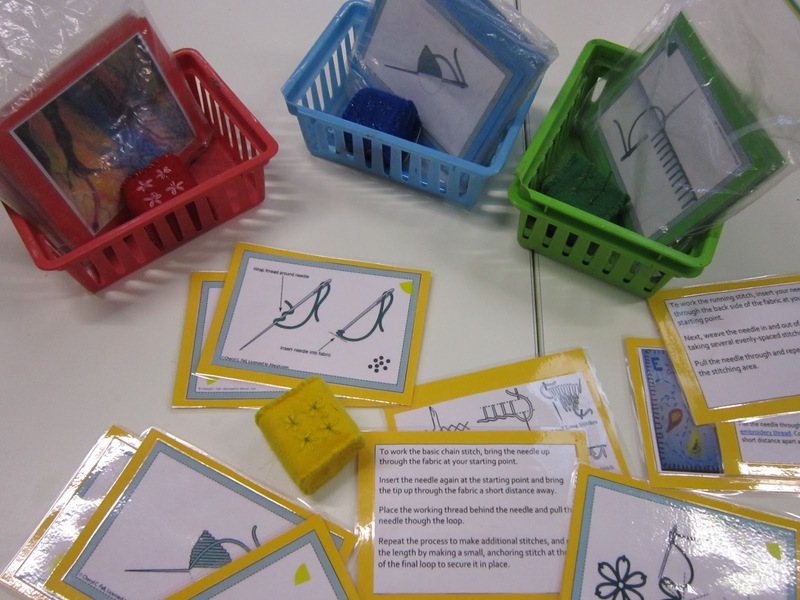 You can see the kids have been working very well with this project, even though it takes time and patience to learn the skill and get used to the fiddly threads. Here's a tip for any other art teachers out there. 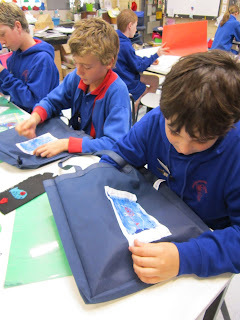 The kids had difficulty pinning their fabric onto the front of their bags in order to sew it on so I used a few dabs of craft glue (not too much as it makes it difficult to sew through.) to keep the pockets on the front of their bags so they could sew them on more easily.